Uganda's Bureau of Statistics census data reveals that most residents are Christian, while Islam has a strong minority presence. 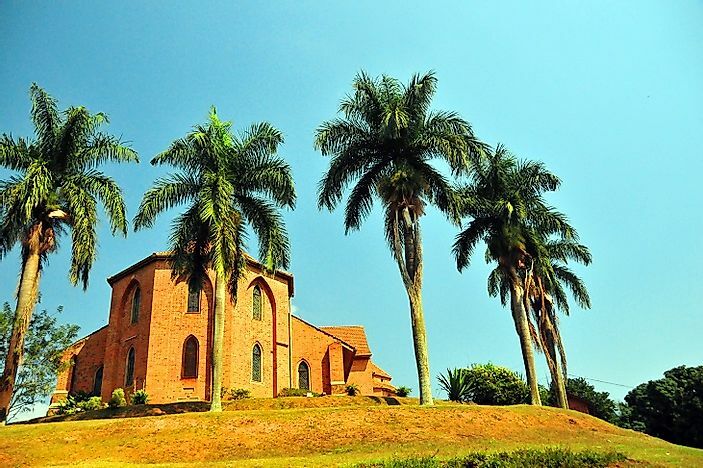 Founded in 1919 in Kampala, Saint Paul's Cathedral-Namirembe is the oldest Anglican cathedral in Uganda. Uganda is a landlocked country located in East Africa with a diverse population of approximately 37.8 million. The residents of this country practice a wide range of religions, a freedom that is protected by the Constitution. The government recognizes some religious events as national holidays. These include Good Friday, Easter Monday, Eid al-Fitr, Eid al-Adha, and Christmas. However, religions must be registered with the government in order to be practiced. Some religions have been restricted from registration. This article takes a look at the most widely practiced religions in the country. Christianity is the most widely practiced religion in the country. Around 84.5% of the population practices one of several Christian denominations. The first non-indigenous religion to reach this country, however, was Islam. Muslims began arriving from the east coast of Africa in the 1830’s. British explorers made their way here in the 1860’s. After learning some of the teachings of the Christian religion, the Baganda king requested that the Queen of England send missionaries. The first Protestant missionaries arrived in 1877. They were soon followed by French Catholic missionaries in 1879. The two denominations soon began a rivalry in the courts which was respected by the local culture and helped to spread the religion. Today, the principle Christian denominations practiced in the country are Roman Catholicism (39.3% of the national population), Anglican Protestantism (32%), and various other denominations (13.2%). Sunni Islam is practiced by 12.1% of the population and another 1.6% practice some other branch of Islam, such as Shia, Ahmadiyya, or others. As previously mentioned, this religion arrived to the area in the 1800’s by way of Muslims coming from the east coast of Africa for trade. The Baganda king first converted to Islam before inviting Christian missionaries which initially helped the spread of the religion. In 1971, the country had its first Muslim president. His immigration policies led to the removal of large numbers of Asians from the country which reduced the number of Muslims in Uganda. Today, the biggest populations of Muslims can be found in the central and eastern regions of the country. Approximately 1.6% of the population practices either indigenous religions, Buddhism, the Baha’i Faith, or Hinduism. Indigenous beliefs are typically practiced in conjunction with the other more widely practiced religions. For example, around 27% of the population believe that reverence of spirits and remembrance of ancestors can protect them from bad luck. Another .2% of the population identify as being either atheist or agnostic. Despite the constitutional provisions for the protection of freedom of religion, cases of religious persecution have been reported. Some Christian churches have received threats of violence and some Christian converts have been attacked, killed, and excommunicated by Muslim family members. The government also refuses to register some churches that have been ruled as cults rather than religions. These include the Movement for the Restoration of the Ten Commandments, the Abengeri, and the Serulanda Spiritual Foundations. Local authorities have also detained certain individuals for practicing non-registered religions. Those that have been found guilty have been sentenced to pay a fine and to complete community service. Additionally, the law prohibits the practice and congregation of any political party that is based on a religion.